Clean and sparkling windows can add life to a property. Spotless windows not only help ensure your commercial or residential property looks great, but they make sure your property is clean and hygienic. For professional and reliable window cleaning, look no further than Totally Bright. We are a cleaning service in Sydney with years of experience in commercial and residential cleaning services. Window cleaning is one of our specialties and we take great care to offer high standards of quality. Our window cleaning system is chemically free and totally self-contained. 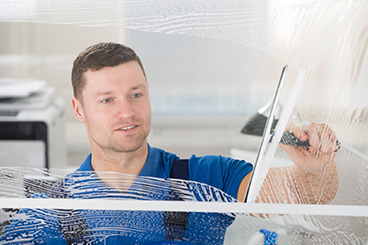 We are able to offer a mess-free and hassle-free window cleaning service. We are a fully accredited and insured cleaning company and we take great pride in what we do. As part of our window cleaning service, we wash the outside and the inside of the glass pane along with wiping the sills and frames. When it comes to internal windows, we clean the glass manually using traditional tools and equipment. For external windows, we use our extension pole system and use purified water for the best results. At Totally Bright, we aim to offer a friendly, reliable and professional service to our clients. We arrive for the job at the scheduled time, every time to offer a stress-free service. Whether you hire our window cleaning service on weekends, evenings or public holidays, our charges remain the same. No hidden fees or additional charges whatsoever. Our cleaning technicians are fully trained and have years of experience in all aspects of cleaning. Get in touch with us today for a free quote. Call 0424 472 670 now.